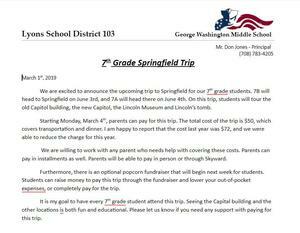 We are excited to announce the upcoming trip to Springfield for our 7th grade students. 7B will head to Springfield on June 3rd, and 7A will head there on June 4th. 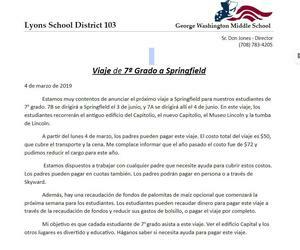 Estamos muy contentos de anunciar el próximo viaje a Springfield para nuestros estudiantes de 7o grado. 7B se dirigirá a Springfield el 3 de junio, y 7A se dirigirá allí el 4 de junio. All students at George Washington Middle School have received student IDs. Students must wear the IDs every day for identification and as a bus pass. If your child loses their ID, a replacement ID will be printed immediately and given to them for the cost of $10. Temporary IDs are available for $5. Las diplomas se ordenarán pronto y necesitamos saber cómo desea que su nombre aparezca en la diploma. Diplomas will be ordered soon and we need to know how you want your student’s name to appear on the diploma. Please read the attached letter from Ms. Seabrook, our District School Nurse. Por favor lea la carta adjunta de la Sra. Seabrook, nuestra enfermera del distrito.